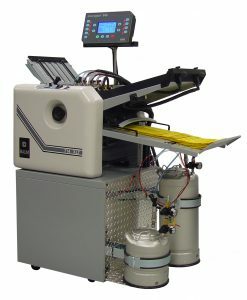 microgluer® is a family of small format buckle plate folding and gluing machines, designed to simplify and streamline the folding and gluing operation for mailing applications. This product is available in formats starting from basic half and letter fold, with or without glue, to more complex mailers that include Z fold and micro perforation. The microgluer® features dot, line or stitch patterns, patented output speed compensation, shutter control output, product and batch counter, and production rate meter. The microgluer® is the simplest and easiest to use table top folder with an integrated glue system and can be configured for all small format, direct mail applications today. Made affordable and accessible to our customers, expandability and flexibility are just part of the advantages to working with the GMS microgluer® family of products.